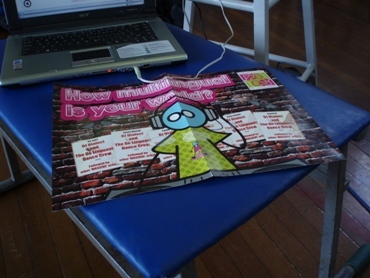 This is a blog experiment from the French department at Nodehill Middle School, Newport, Isle of Wight. It’s called ‘Two Stars and a Wish’ because we want you to comment on the work we publish on the blog saying two things you like and one thing that could be improved. All comments are moderated. Only use your first name when leaving comments and never include your email address. Blog safe. Click on the play button and listen to Sasha helping you to revise for your speaking test after Xmas. Download this Word document and read the words at the same time. Here is 8SM practising the perfect tense for the first time. Well done Azaria and Luke. So impressed I was with Liam's speaking test today in Year 8 that I asked him if I could record it again with Audacity and upload it to Voki. He agreed and here is the result. Well done Liam. You're working at Level 4. Mrs Tonner's Voices of the World project has got off to a great start with over twenty schools taking part in the first task which involved a pupil or pupils recording themselves saying the expression 'Hello, we are from (school) in (country) and you are listening to Voices Of The World.' in their own language and then creating a Voki with the resulting mp3 file. Mrs Tonner has posted all the Vokis individually on the VOTW wiki as well as editing all the audio together to make a groovy podcast which you can listen to by clicking on the Gcast player above. For October's task, Mrs Tonner would like us to use Animoto to create a multimedia slideshow of our pupils singing their national anthem in 30 seconds or less. Sounds like fun. Asa: I think it is really cool because you can listen to different accents and languages from pupils of our own age. Jasmine: I think it is a great idea because you can listen to different voices of the world. Harry: I thought it was cool because it had 22 different schools! 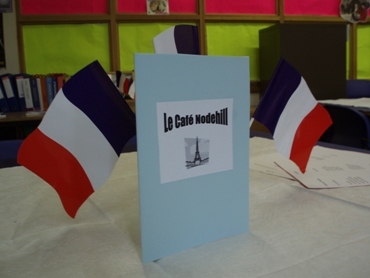 Tonight was Nodehill's annual Open Evening and as in previous years, the French department promoted itself in two ways, firstly by magically transforming a classroom into a French café and secondly by presenting some of the ways it uses ICT to enhance language learning. 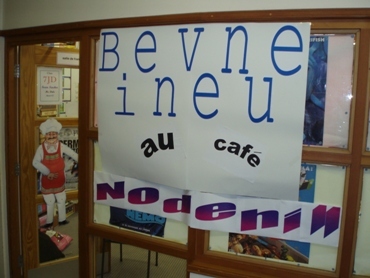 Le Café Nodehill returned to my room after a four year absence and was expertly manned by Mrs Jennings, Mrs Pearson and my new colleague Ms Peoples, who worked tirelessly throughout the evening, making coffee, preparing sandwiches and washing up cups. Our Year 8 waiters and waitresses did a great job too asking customers what they wanted in French and then delivering the appropriate drinks and snacks. Likewise, in one of our ICT suites, the Year 7 pupils gave demonstrations of the different interactive exercises we use to revise and reinforce language covered in class. 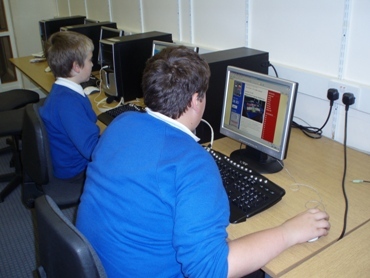 Particularly popular was the new version of TaskMagic which the school has recently bought having successfully used the original for the last few years. 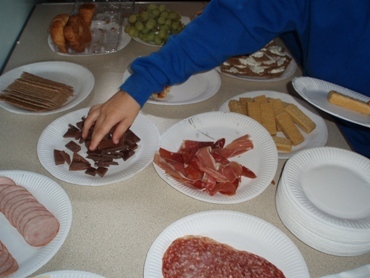 The French blog and the pupil Vokis seemed to catch parents' and prospective pupils' imaginations and consistently provoked the remark, "French wasn't like this in my day!". All in all a very successful evening. Thanks to all those who helped out. We enjoyed having you. 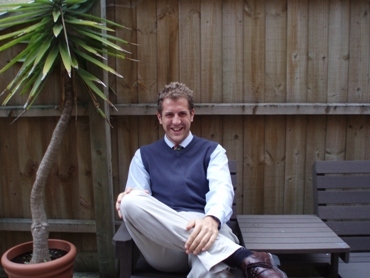 Thank you Mr Downe for giving us the lowdown on your winning formula. It's good to share. If this was not enough to satisfy pupils' appetite for expanding their cultural awareness, they were also treated to the delight of watching a short streamed video clip entitled Mission French Breakfast during house assembly this afternoon. Created by Catherine Basset, former BBC TV director, the film depicts Double Agent Lucas (aged 6) being assigned the task of finding out what French people typically have for their breakfast. The little lad does a sterling job naming each breakfast item in turn and the on screen prompts help the viewer to digest the new language in bitesize chunks. To reinforce the breakfast vocabulary we chanted du pain, du beurre, de la confiture etc and pupils could read the words easily even from the back which was great. If you would like to watch Mission French Breakfast yourself, you can drop Catherine an email and she will willingly send you the link. She has also made a film called Jacques a dit about practising parts of the body in French which is well worth a look too. European Day of Languages may be over for another year, but for 26th September 2007, I think it's been Mission Accomplished. In today's Citizenship lesson with my new form class, to kick off the new year, we made a voki as Nodehill's contribution to Mrs Tonner's Voices of The World project. Hope you enjoy it. Here is Jordan in Year 8 describing what he did last weekend. Feel free to leave a comment. During our induction day today, I thought it would be a good idea to create a couple of Vokis with my new Year 7 class to show off their French speaking. Harry and Cindy volunteered to talk about their daily routine using the expressions we've learnt recently. Harry: It was kind of cool. I'm glad that lots of people are going to listen and watch me as a turkey! Cindy: I really enjoyed it. It has given me more confidence to speak in French. I hope everyone likes my hat. It's cool. Harry and Cindy: We hope you enjoy our Vokis. Why not try some out for yourself?